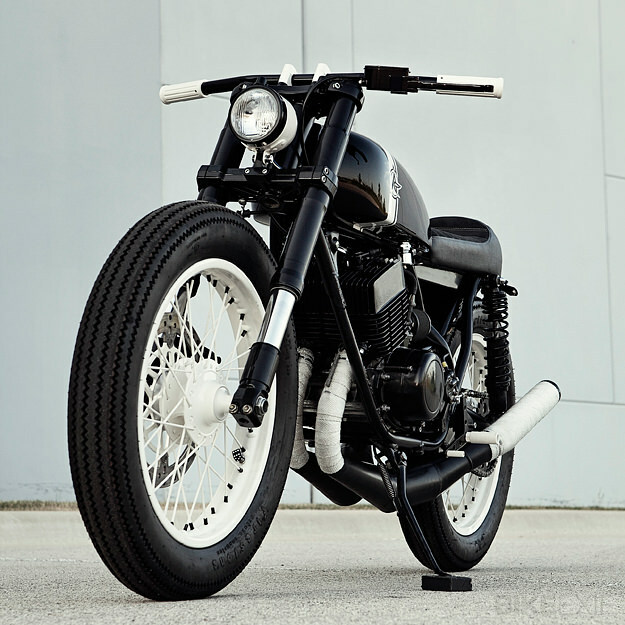 This bike started as a 1973 RD350 that was halfway towards a café racer conversion when the current owner bought it. 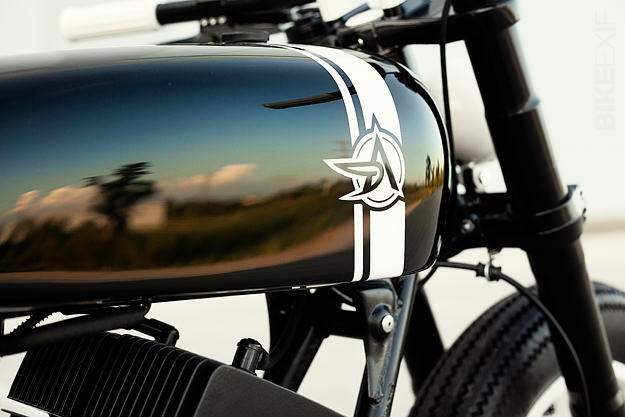 After the bike sat around for years untouched, the owner commissioned Analog Motorcycles to finish the job. 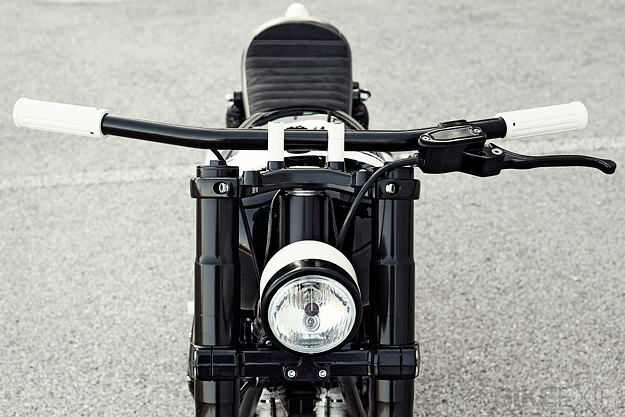 “I started by cutting off the neck tube and welding on a Ducati S2R neck,” says Prust. “This allowed us to use a set of S2R forks and triples, and to complete the suspension, I also mounted a pair of Progressive Suspension shocks.” The original RD rear rim was then laced to the front hub to accommodate a wider front tire. The rear hub and rim come from a Yamaha TZ250 GP bike, so that the stock drum brake could be replaced by a disc. The front and rear rotors and calipers are Brembo (both actuated by the right rear foot lever). 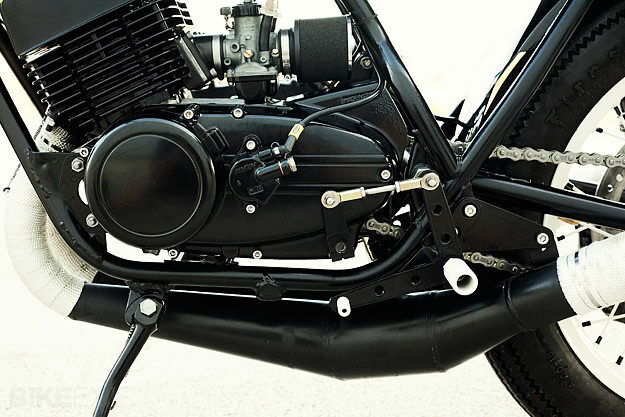 Custom made black stainless brake lines from Hel are also fitted. 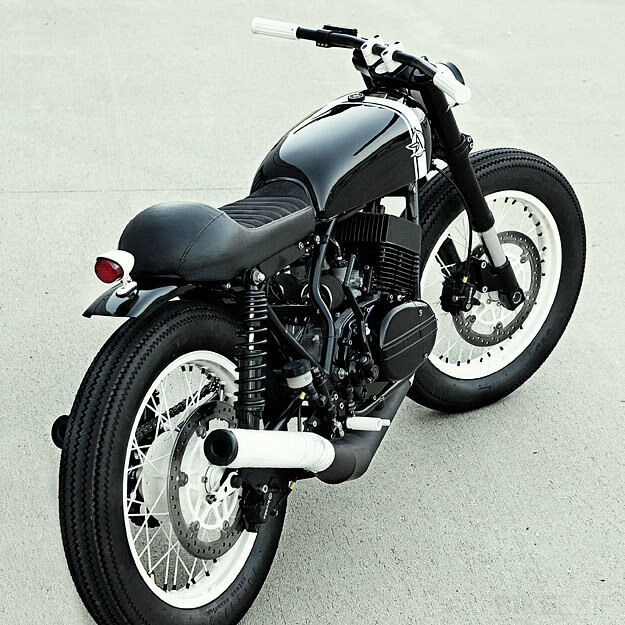 The clutch was converted from cable to hydraulic, using a Suzuki Bandit slave cylinder, while one-inch drag bars hide the internal throttle assembly. “All this was done to give a clean and streamlined appearance at the controls,” says Prust. The engine is mostly stock, but has been treated to lightweight DG expansion chambers for a power boost. Uni pod filters and a high output RDDreams Chinoy digital ignition help performance still further. Prust de-tabbed the frame and fabricated a battery tray to fit under the custom seat pan. The upholstery is combination of leather and Alcantara, with exposed white stitching. The final touch is the deliciously glossy black and white paint, applied by Kiel Sawusch of Crown Auto Body in Lake Bluff, IL. 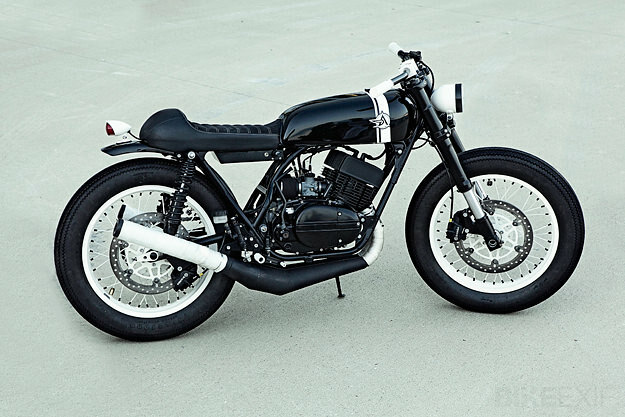 The RD350 has lots of fans without any mods, but the Analog S2RD takes it to a whole new level. Sleek, compact and fast, it’s as close to two-stroke perfection as you can get.